DAP allows you to easily import users in bulk from an external system or database. When you do a single-user-add, all of this is done for that user in real-time. When you do a bulk-add, then all of the above happens for each user being imported, one at a time, when the DAP hourly cron job runs at the top of every hour. That’s the main difference. Check the “Mark Users as Paid” checkbox if you want them to have “Paid” access to the content (just as if they are actual paying members). If you don’t check it, they will all have access as a “Free” user (instead of a “Paid” user), which means they will only have access to content within the Product that you have marked as “Free”. Click on the “Bulk Add Users” button. That will first save this entire list as a CSV file in your /dap/bulk folder on your site. And then, the next time the Hourly cron (dap-cron.php) runs, it will add them one by one to the product, and send them emails as per your Product set up. So if your Product has the “Thankyou-Email” subject and body filled out, it will individually send out each of the users that thankyou email. But please make sure you are using at least DAP v4.2.1 and LiveLinks v1.7, because what’s explained below is only available only since then. The only required fields are Email, FirstName and ProductName. If you do not want to supply a value for any of the optional fields, but still wish to import certain others, then just leave those fields empty in the data row (but the commas should remain) as shown below. Create a file with the name /dap/bulk/importusers.csv file so it has the users you want to import in the format specified above. * Limit the number of users you are importing with this method to not more than 500 users (rows) at a time. Otherwise the import may timeout, because the import occurs real time, because you’re running the script manually, and not via cron. If the user already exists in dap, then the script will just skip that user and move on to the next user in the bulk add list. We support this type of bulk import with DAP 3.8. Extract the content of importusers.zip and upload to /dap/bulk folder on your site. i dont see dap-bulkimport.php …how do i add the file? where can i get it? 1. We currently do not use Paypal subscriptions. We would ideally like to let them do a simple purchase for the first time. And then put them on a subscription after first period expires. May be a combination of auto responders with Product B available after Product A? Ideally, we want the product B (renewal) to be available only when the renewal is near.. Can DAP do this? 2. I understood that we can import customers easily into DAP. But when will their subscription expire? Like I said, people have purchased without subscriptions right now. Can we set their “purchase date”, and set an auto responder to request renewal? Veena, I have 2 lists I want to import and they might have duplicate entries. 1. If I import one and then the other, will DAP handle the duplicates (not importing a given duplicate) or will I have duplicate users in the same product/list? 2. If I merge both list in tables or excel and the resultant list has duplicates, how will DAP handle it? Will the resultant user list have duplicate entries or not? Yes, there will be 2 records in users->manage page, but both records will be tied to the same user account. So say list1=product1, list2=product2 in dap, then you will see the same user (same userid/password) associated with product1 and product2 in users->manage page. To test, simply go to dap add users page and add user first to product1, then go to manage users page and see what you find there. 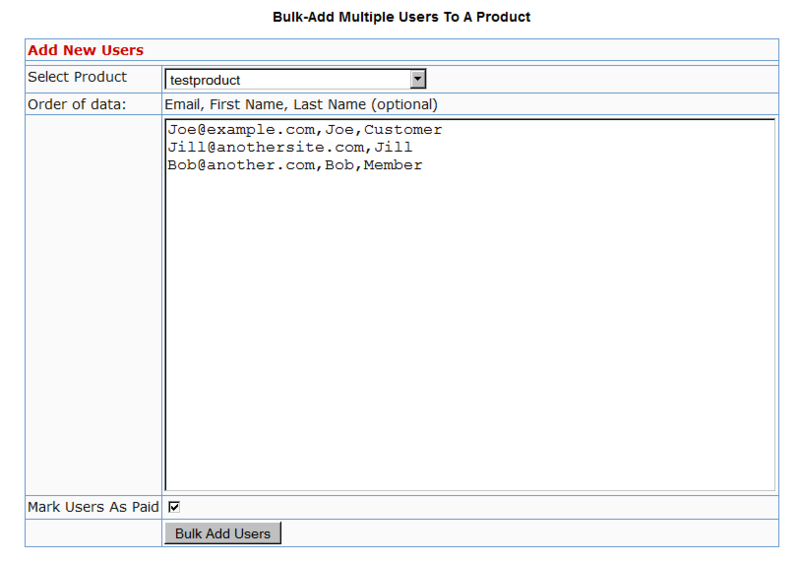 Now add the same user to product 2(via dap admin -> add users page) and then see what you find in users->manage page. You will see the same user has access to product 1 and product 2 but both products are tied to the same user account and the user can access both products using same id/password. Can DAP be integrated to use with the new AutoReponser Service called SendReach? I’ve been using DAP for many years…with Aweber, but haven’t been able to figure out how to add buyers from my DAP Products to SendReach. I appreciate your assistance…I tried to comment on the Aweber to DAP page…but it forwarded me to here. Is there any way to integrate sendreach with DAP? Yes, you can integrate DAP->SendReach for both paid / free products. The integration is one-way – from dap to sendreach. Last time I checked, SendReach did not have a way to Pass Form Data via HTTP POST to 3rd party scripts. So if you use a SendReach web form and try to connect it to DAP, it wont work. But if you a DAP signup form, dap will automatically add the subscriber to SendReach list. This video is not working? >>This video is not working? http://www.digitalaccesspass.com/videos/BulkAddUsersToDAP.php << Please check. It works now. We already have a monthly subscription membership site. We want to move over to DAP. Is it possible to import users at various levels of monthly subscription to DAP? Yes, you can import users at a product or membership level in DAP. You will have import one product/membership level at a time, but you can do several of them successively, one right after the other, in one sitting. Is that “user already exists on this product” or “user exists”? For example, if a user already exists and is assigned to Product A, and the bulk import is trying to add them to Product B, the user will already exist – so will the bulk import skip them (as they already exist) or will it add them to the Product B in addition to Product A? One extra detail that would have been useful to me – username can be no more than 20 characters. Anything extra is chopped off. I’m trying to do an extended import with no success on several of the fields. email,firstname, and lastname are successful but that’s it. I’m using your format example (see below) Has it changed order? I’m keeping commas for blank field spaces. Please open a support ticket with all the details (including logs from dap system->logs). We will take a look.